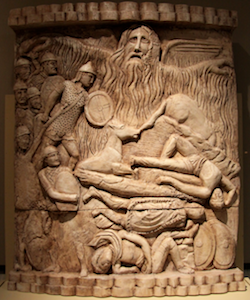 Roman soldiers were some of the first and most fervent converts to Christianity. They, along with hosts of slaves and civilians who were believers, had been persecuted and killed for their faith for over 100 years when Nero began the Imperial persecution of Christians in 64 AD. 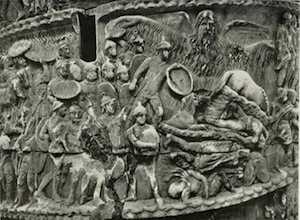 Marcus Aurelius, however, was surprised to find such a host of Christians in his own army there in Carnuntum. Aurelius’ Epistle to the Roman Senate is not the only place in ancient literature where his story of miraculous rain is told. Christian and pagan writers were fascinated by such an unusual tale, especially because it was told by an emperor. Tertullian tells it in Apology 5; Eusebius recounts it in his Church History 5.5; Orosius in Seven Books Of History Against The Pagans 7.15; Gregory of Nyssa in Oration; Cassius Dio in Roman History 71.8. The weight of so much retelling of the narrative by Christian and pagan writers certainly points to the historicity of an unusual, miraculous rain event as a result of Christian prayer witnessed by Marcus Aurelius at Carnuntum. It was so impressive to Aurelius that he had the miraculous storm event depicted on his column that is still standing in the Piazza Colonna in Rome. Some pagan writers attribute the miracle to Jupiter or an Egyptian god. If one certifies Aurelius’ Epistle as true, it is ironic that this Philosopher King presided over one of the bloodiest persecutions of Christians—the mass murders in Lyons and Vienne in 177 during his reign. 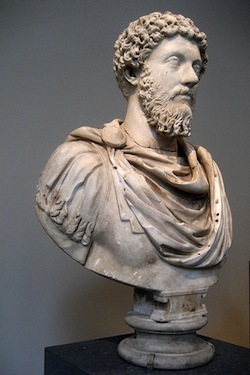 In the fourth year of Aurelius’ reign in 165, Justin Martyr, who had pleaded the Christian case to the 29-year-old Aurelius in 150, was arrested with six of his students, brought before Rusticus the prefect of Rome and confessed, “I am a Christian.” He was commanded to offer sacrifice to the gods and replied, “No right-thinking person falls away from piety to impiety,” whereupon he and his students were “scourged and led away to suffer punishment by decapitation according to the laws.” Anonymous Eyewitness, The Acts Of Martyrdom Of St. Justin And Companions.